Ghostwatch: Behind the Curtains: Merry Christmas! 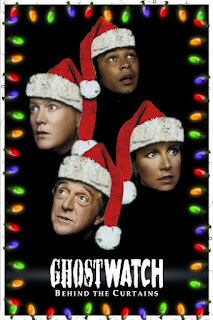 Season's Greetings, Ghostwatchers! Yes, another year has almost passed, and we are edging closer and closer to the 20th anniversary of Ghostwatch. Who knows what next year might bring? Well, National Séance 2011, for one thing! What a great night, the last event turned out to be - thanks to everyone who participated, and roll on October! Whilst we're still hard at work on the doc, we thought it might be fun to ask what questions YOU might put to the makers/stars of Ghostwatch? Try and think of at least one question for any of the cast/crew from the original film and leave them in the comments box below, in our forum, or on Facebook. The best entries might even be included in the final cut. Do get writing, and we look forward to hearing from you! Oh, and for anyone who has wondered what phone-in caller Kevin Tripp looks like in the flesh ("Cheese and pickle sandwich, it was..! "), here's an interview featuring actor, Brendan O'Hea, discussing a recent production of Waiting for Godot. As always, many thanks for your continued support, and we hope you all have a Merry Christmas and Happy New Year! 1) What do think of the fact that horror fans outside the UK so often have to resort to surreptitious means (e.g., blackmarket DVDs, cracked DVDs or DVD players, illegal bittorrents) in order to see the original Ghostwatch? 2) What do think of the fact that so many of us have done so? Surely Mr Pipes could have appeared in your illustration as a snowman? ?